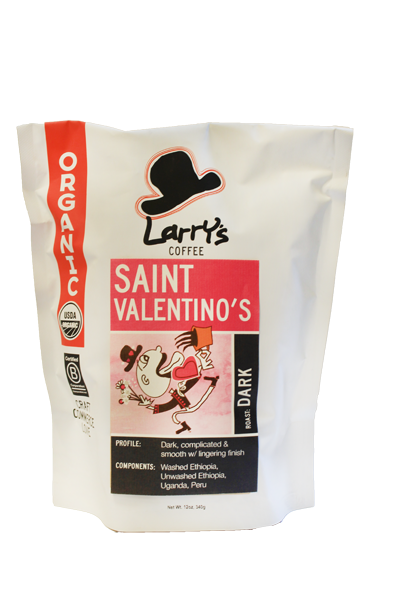 Dark chocolate undertones with subtle berry, hints of walnut and creamy finish, makes this blend sweet, smooth and luscious. The most limited run of our seasonal offerings is this sweet and smooth blend which aims to pierce the heart of those with a sweet tooth in the same manner as a box of chocolate covered cherries. Combining smooth, rich coffees from South America with just a kiss of African coffees creates a deliciously luscious brew. Heavy-bodied with strong chocolate notes, each sip reveals hints of fruit and nuts within the swirl of flavors. Our dark roast is never burned or bitter, instead it develops an irresistible medley of caramelized sugars which linger on the palate. Roasted for 6 weeks only, to part with this blend each year is such sweet sorrow, indeed.